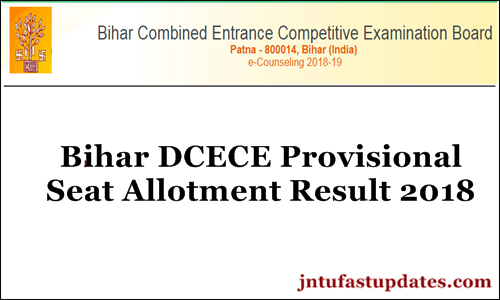 Bihar DCECE 3rd Round Allotment Results/ Letter 2018: Bihar Combined Entrance Competitive Examination Board (BCECEB) will be Released the 3rd round provisional allotment results today, 13th August. Aspirants applied for Diploma and Polytechnic courses can check the 2nd round allotment result from today on BCECEB official website, bceceboard.bihar.gov.in. aspirants can check whether they got the admission in the provisional allotment or not and can download Bihar DECE Provisional allotment letter to report at the allotted college. The BCECEB is declared the Bihar Polytechnic/Diploma provisional seat allotment today 10th august. Hence students seeking to get admission in Polytechnic Diploma courses can stay tuned to the official portal to check the status of seat allotment. Bihar Combined Entrance Competitive Examination Board is the state level board that monitors various competitive examinations and offers admissions for the students. Annually many of the hopefuls apply to get admission for various courses. BCECEB has recently conducted the Diploma Certificate Entrance Competitive Examination (DCECE) for aspirants seeking admission into Diploma/Polytechnic courses. Aspirants qualifying the test with good merit will get admission in [Polytechnic (Engg.) / Part Time 4 Years Polytechnic Engg. / Para Medical-Dental (Matric Level) / Para Medical (Intermediate Level) courses. Annually a large number of aspirants compete for the DCECE examination. Candidates qualifying this test with good merit can only get admission in their interesting courses. The Bihar Competitive examination board has now announced the Bihar DCECE provisional allotment results 1st round on its official portal. Candidates who have come across the selection process ca check the result. Candidates who got the admission in 3rdround seat allotment can download Bihar Polytechnic/Diploma allotment order 2018 from today itself (from 10th august). Hopefuls have to pay the requisite admission fee while reporting at the admission colleges. Dates to report at the allotted colleges are from 8th August to 11th August. On the homepage, Bihar DCECE Polytechnic/Diploma Provisional Allotment Result 2018 Link appears on the screen. Click on the link and enter the required details such as the register number, password etc. The result gets downloaded on the screen. Check whether you have allotted seat in 3rd or not. Take a printout of the allotment order if the admission is allotted. sir 3rd councelling ka result aaya bhi hai ya nhi . confirm nhi ho pa rha rha h.
as notice me likha h ki 24 sept last date tha admission lene ka. Bt seat allotment abhi tk nhi hua h,. kuch clear nhi ho pa rha.